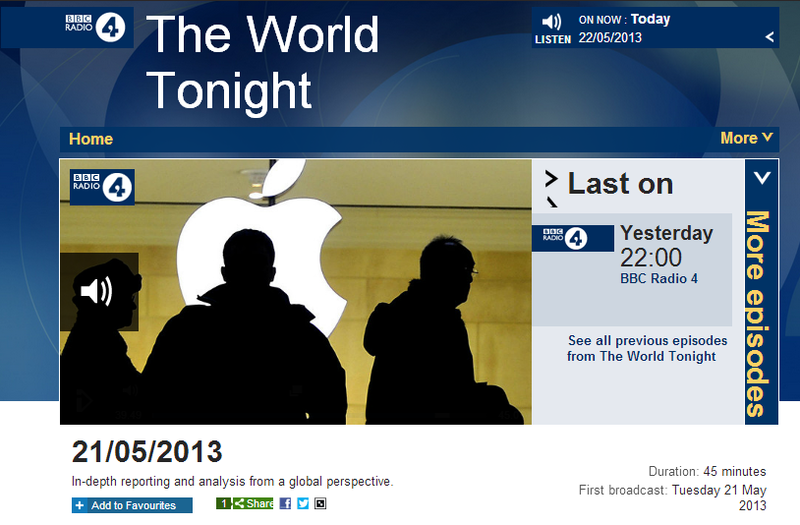 In addition to the written version of Yolande Knell’s recent feature on offshore gas finds which appeared in the ‘Features & Analysis’ section of the Middle East page of the BBC News website, the subject was covered in an additional report by Knell which was broadcast on May 21st 2013 in ‘The World Tonight’ on BBC Radio 4. The relevant section of the programme begins from 34:16 here, with Knell first visiting Lebanon and Israel. At 38:17 she reports from Gaza. Beyond the euphemistic statement that “in 2007 the situation got more complicated”, Knell does not make any real attempt to explain to her listeners that the main stumbling block preventing the exploitation of offshore gas near the Gaza Strip is the fact that the recognised representative of the Palestinian people (and hence the body tasked with administrating their natural resources) – the Palestinian Authority – has no control over the Gaza Strip due to the violent takeover of that territory by a terrorist organisation. Instead, Knell churns out the old mantra according to which it is “the conflict between Israel and the Palestinians” which is to blame. Especially insidious is Knell’s treatment of the subject of the shortage of cooking gas in the Gaza Strip, which she claims is “partly due to border restrictions imposed by Israel” – without making any attempt to clarify to listeners what the other part of that “partly” might be – and hence portraying the problem as an Israeli-created one. “According to the data of the Land Crossings Authority at the Ministry of Defence, the infrastructure of Kerem Shalom meets the requirements and provides the necessary needs to transfer all goods into Gaza, including cooking gas, but the crossing infrastructure are not being exploited to its fullest when the volume of orders by gas suppliers from the Gaza Strip does not match the needs of the public. Here it should be noted that as part of the expansion of civil policy, in quarter A of 2013 Israel approved the transfer of tens of thousands of gas cylinders for domestic use. “There is no public entity in the Gaza Strip that supervises the cooking gas field and there is no public storage facility that allows accumulating surplus for “a rainy day”. During the summer months, the demand for cooking gas in the Gaza Strip declines as well as utilization of the infrastructure in Kerem Shalom crossing. In addition, the credit policy of the Palestinian Authority ‘s Energy Authority limits the local merchants in Gaza from holding sufficient supply. Extending credit lines will allow accumulating larger stock toward the winter. So in fact, the shortage of cooking gas in the Gaza Strip actually has nothing to do with “border restrictions imposed by Israel” as claimed by Knell, but it does have rather a lot to do with the policies of the Palestinian Authority. Knell obviously made no effort whatsoever to fact check the accuracy of her claim blaming Israel for the shortage of cooking gas in Gaza. In fact, she merely parrots the politically motivated propaganda surrounding the issue as put out by Hamas. The knee-jerk blaming of Israel for any and every problem in the Gaza Strip may well be the quickest, easiest – and most fashionable – option, but BBC audiences expect far more from journalists committed to accuracy and impartiality. 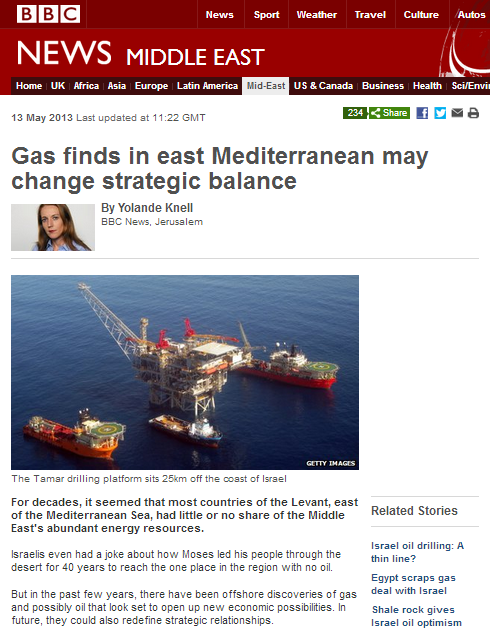 An article entitled “Gas finds in east Mediterranean may change strategic balance” by Yolande Knell which appeared in the ‘Features & Analysis’ section of the Middle East page of the BBC News website on May 13th 2013 is on the whole fairly balanced and accurate. Let’s examine the accuracy of that last sentence first of all. The violent Hamas take-over of Gaza took place between June 5th and 15th 2007 and the Palestinian Authority – the internationally recognized representative of the Palestinian people – was forcefully ejected from power. Following that event, both Egypt and Israel largely closed their borders with the Gaza Strip due to the fact that the body charged with joint security arrangements under the terms of the Oslo Accords – the Palestinian Authority – no longer exercised any control over the territory. However, Knell’s suggestion that the “naval blockade of Gaza” was “tightened” immediately after the 2007 Hamas coup (as any reasonable reader would understand her phrasing) is incorrect because the naval blockade was not put in place until January 2009. Under the terms of the Oslo Accords – willingly signed by the representatives of the Palestinian people – Gaza’s coastal waters remained under Israeli responsibility. The agreements divide those waters into three different zones named K,L and M.
Following the Israeli withdrawal from the Gaza Strip, the November 15th 2005 agreement signed between Israel and the Palestinian Authority (Agreed documents on movement and access from and to Gaza) made no change to the above provisions. 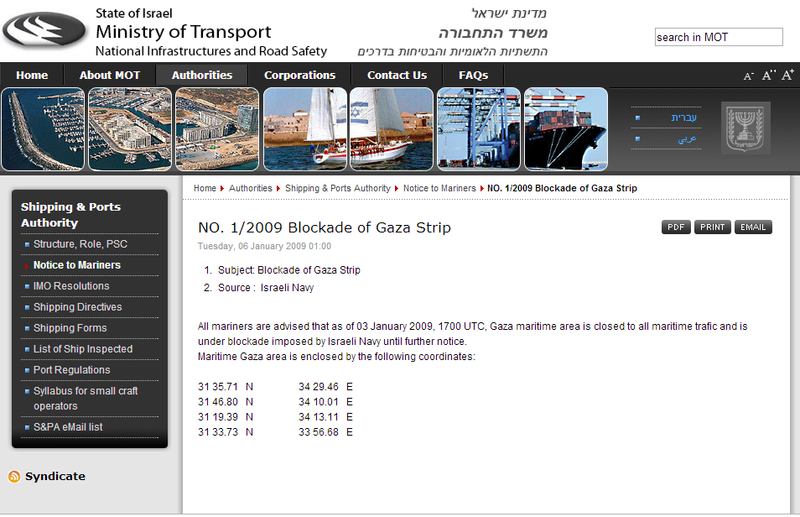 After the violent takeover of the Gaza Strip by Hamas in 2007, Israel did introduce maritime zones off the coast of the Gaza Strip as part of efforts to reduce arms smuggling into the territory – for example see the Notice to Mariners No. 6/2008 of August 13th 2008 – but that is not the same thing as a naval blockade (which has a specific legal definition) and hence Knell’s claim of a 2007 tightening of “the naval blockade” is inaccurate. Is Knell’s wider claim that “the conflict between Israel and the Palestinians has prevented further development of the [gas] field” an accurate representation of the situation? Well obviously, had the Palestinians chosen to develop the economy of Gaza Strip after Israel’s 2005 disengagement and had a terrorist organization not overrun the territory, turned it into a terrorist enclave which necessitated the implementation of maritime zones and later the naval blockade and had it not ousted the internationally recognized representatives of the Palestinian people authorized with signing agreements on their behalf, there may have been more opportunity for exploitation of offshore gas resources. But of course it is much easier just to vaguely lay any blame at Israel’s door rather than to trouble BBC audiences with an exact and detailed account of events for which Palestinians might be perceived to have some responsibility.